CLARK offers a complete inventory of Polywheels, Poly Press-ons, casters and press-on tires designed to exceed Tire and Rim Association carrying capacity standards. CLARK warrants all tires sold under its program to be free of defects in both material and workmanship for the life of the tire. Finally, a load wheel engineered to withstand the demanding needs of 24/7 warehouse applications. With the "No Bond Failure" guarantee the new Cushothane XL3 takes the worry out of handling heavy loads, high speeds, and long runs. 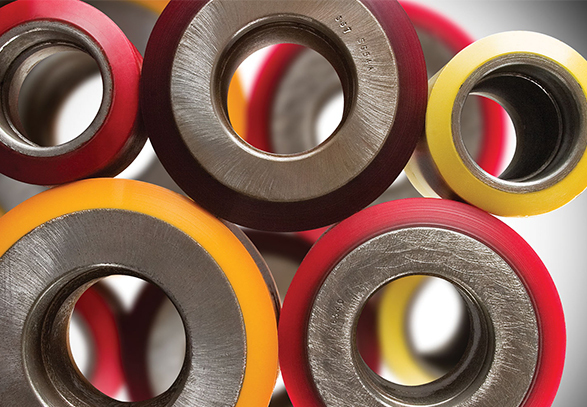 Superior’s standard polyurethane is engineered to perform reliably in everyday use and achieve maximum work life in general purpose applications. Superior’s most economical load wheel, the standard Cushothane is perfect for circumstances that do not require premium polyurethane. Superior’s Standard Cushothane Load Wheel is a proven workhorse, time tested to outperform the competition. Superior’s premium EZ polyurethane is designed for applications where Battery life, operator fatigue and vibration are primary concerns. Formulated to prevent wheel chunking problems, EZ wheels are excellent in rough floor and docking applications, The softer EZ polyurethane deflects more. When coupled with our special adhesive and state of the art bonding process, the EZ wheel overcomes impact caused bond failure. Cushothane EZ Load Wheels have carrying capacity equal to standard Cushothane Load Wheel as well as remarkable cut and tear strength. Superior’s high performance XL polyurethane is engineered to offer extended service life in the harshest conditions. XL wheels are engineered to limit heat build-up caused by high heats, long runs, and heavy loads and are site proven to eliminate bond failures, improve truck productivity, reduce maintenance labor and lessen overall wheel and bearing expense. Cushothane XL Load Wheels have the highest load carrying capacity with excellent cut and tear strength. Engineered as a drop-in replacement for all OEM’s, the infinitely adjustable STR Stabilizer Caster is site proven to eliminate rocking and provide greater stability in the most demanding operating environments. With a greaseable wheel, axle and pivot joint, the rust proof STR Food Service Stabilizer Caster is a perfect choice when lubrication is required to overcome corrosive brine, animal fats and cleaners in slaughterhouses and other food service applications.